Here's PART-2 of the Furniture Exhibition.....For all those who are looking for PART-1 of the same....please click here. 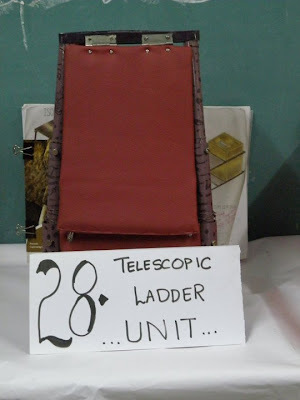 Kamal's Telescopic Ladder Unit - Kamal has used an old telescopic ladder.........which is normally used as a ladder...but in small apartments with space constraints.... this can be folded and used as a seat with a storage underneath ideally for small things like stationery or magazines. The speciality of this is that even when the ladder is opened for use....things inside the storage remain intact. Vaishnavi's Compact box can be used as a dresser, a study table or a work table. all in one..... yet compact. Notice the mirror on the left which is concealed when used as a table. 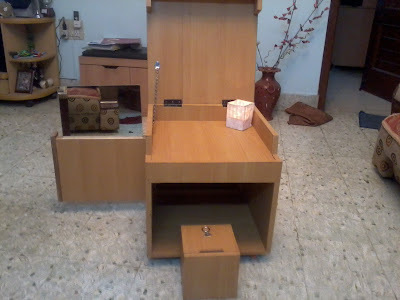 The small box underneath is the stool and also a storage. 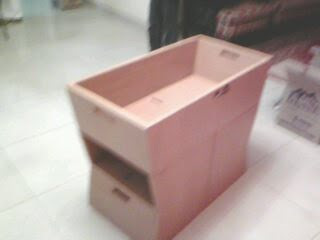 BIG VALUE FOR SMALL MONEY..... Vindhya's ALL-in-ONE table is a single piece of furniture......resembles a cube with 2 faces cut off. It has various utilities on all it other faces. As you see here, it can be used as a kid's study table or probably like a kid's dining table...on the other side a center table with a magazine and newspaper pit. 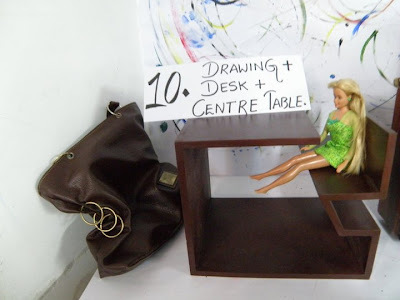 Vijayalakshmi's Aquarium center table looks delicate with a glass case separating the legs and the aquarium. She calls it a coffee center. The legs of the table stores the crockery, cutlery. The special case provided under the aquarium can be used to store sugar cubes, cookies etc., needed for a coffee or a tea meeting. Ideal for people having home offices. 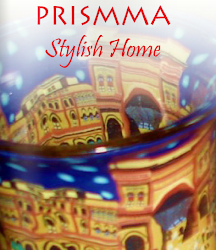 It not only reduces the time to move in and out of your kitchens but also looks elegant in any corner /center. 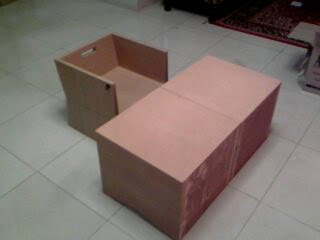 Swati's Single seater can be opened up to a double seater and a table. Susanna Rai's Study unit is a wall mount designed specifically for a kid's room. This special feature of this unit is that when not in use....it can be put on the wall for display as a deco unit in a child's room. 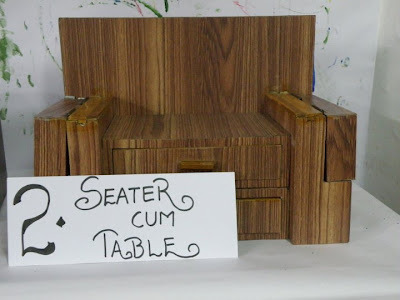 It has small stools for children which are shaped in the form of alphabets. 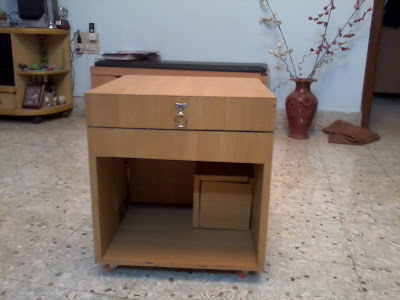 Divya Chikkanna's Furniture is a very practical utility furniture for storage of very obvious items like garden equipments, laundry clothes, vacuum cleaners, detergents etc. This can be made using recyclable materials. The concept is very simple...but very useful. This can be placed in the balcony or terrace of any apartment. It looks neat and does not occupy too much space. It comes with wheels for easy movement. It also has an iron board on top. The openings that you see are for cane baskets to segregate the "to-be" washed clothes. It has hooks to hang the pressed clothes while still using the board. 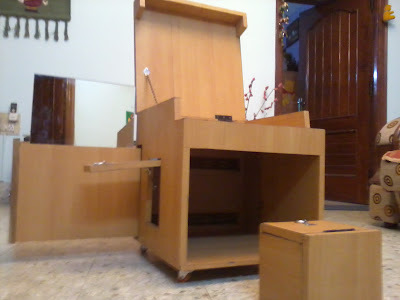 Shamaan's concept of this furniture is that it can be used as a display on top. 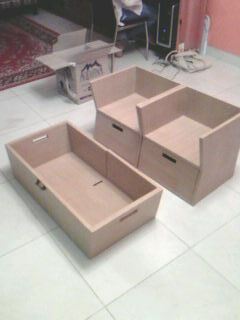 When opened it multiplies its utility to be chairs with storage underneath and a table. Spacesaver indeed!!!!! can we get them in mumbai? I find the multi-utility table an inspiration by itself.